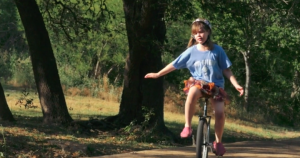 Our Story | Are We Riding on One Wheel? Or, Instead, Are We Free? After Maureen and my trip to MD Anderson in Houston on Monday and Texas Oncology in Dallas on Tuesday, we returned home yesterday, reconnecting with our three children who started school on Monday. The start of school is a special time. It reconnects us with the idea that we can start afresh, start new… write a fresh chapter as my friend, Terri Wingham, would say. How many times in life do we find ourselves riding on one wheel? How often do we find ourselves in a health situation, family situation or work situation, where all of a sudden we realize that the other wheel, the handlebars, the brakes and everything else is gone? For the rest of this post to make the most sense, you really need to stop reading now and click on this link and watch the Uni-Saders trailer. It is just over 3 minutes and is being submitted to the SXSW Film Festival as a documentary. Katelyn, who made the quote above, is one of the two little girls holding hands. Ella, the other little girl, is one of her best friends. They are both in 4th grade, and you will see them holding hands in various spots of this video. Jimmy Agnew not only initiated this club but is also a 2nd grade teacher at St. Andrew’s Episcopal School. He is not just a great teacher but a really special human being. He has changed our daughter’s life. As Maureen and I departed for Houston on Monday, we were anxious. We were nervous. Over the course of our 24 years of marriage, I’ve always felt like we are riding a bicycle built for two, flowing perfectly in tandem. Cancer has been really busy trying to invade our rhythm, but Maureen and my wheels aren’t just connected by a chain. They are connected by love. I am at my strongest as a human being, as a husband, as a father, as a business person when that love is driving me forward. I feel God’s presence every time I hold my wife’s hand or see her smile. Without our love, the last few days could have been really scary. Actually, the last few days were scary. That emotion lurks around every corner in the fight with cancer. Love doesn’t make the fear go away; it just changes how much power fear has over you. In some ways fear is like the wall for a unicyclist just learning to ride. As Jimmy Agnew says in the UniSaders video, “Look where you want to go. You don’t need to look at the wall. The wall isn’t going anywhere.” As a result of Dr. Linda Chavez MacGregor and her team at MD Anderson Cancer Center and Dr. Joyce O’Shaugnessy at Texas Oncology in Dallas, Maureen and I are no longer looking at the wall with her cancer. Instead we are looking ahead of us. For 24 years, I’ve known my Maureen is special. It appears her cancer cells are just as unique. That is the thing about cancer. Like us, it is not one big thing. It is unique, even when it looks to be the same. We have to understand its individual spokes in our cells to know exactly the right approach to combat it. We are on a path in the next several days to do just that, with another visit to MD Anderson ahead of us, for a biopsy to really get a firm understanding of the exact right approach to treat Maureen’s cancer cells and to explain to those cancer cells that they will have to stop their progression. In other words, we are about to write the first pages of our new chapter. As we commence on this chapter, I come back to where I started and our daughter, Katelyn, and her unicycling club. I don’t suspect Maureen or I will ever figure out how to do what she does on her one wheel. However, she has taught us how to feel brave and how to feel free as we ride on one wheel into our ongoing fight with cancer. As we make that ride into the next chapter, I also realize that rather than a bicycle built for two, Maureen and I riding on our own wheels, but like Katelyn and Ella on their unicycles, we are riding while we hold hands.